Why does a big battle break out at the end, exactly? As a child, I was obsessed with Disney's 1951 animated version of Lewis Carroll's Alice stories. This was mainly because it was an animated film populated with a host of characters who were as unforgettable as they were unfathomable, but also because it annoyed me. At the time I couldn't put my finger on it, but as an adult, I finally figured out what fascinated me; Alice In Wonderland doesn't have a plot. The 1951 version plays out as a series of strange scenes that follow each other rather than forming a coherent narrative. This is, of course, in keeping with Carroll's original stories, which trade in puns, oblique mathematical references and dream logic rather than characterisation and narrative. Director Tim Burton and screenwriter Linda Woolverton try to make an Alice movie that moves away from this free-wheeling structure, whilst still retaining the characters and imagination of Lewis Carroll. Instead of doing a strict adaptation of the story, Woolverton's screenplay sets the story thirteen years after Alice first entered Wonderland (or 'Underland') and Alice (Mia Wasikowska) has just been proposed to by a young man who, as far as all her friends and family are concerned, is a perfect match. Alice is not so keen, and as she is about to answer she sees a rabbit in a waistcoat and follows it down a rabbit-hole and, well, you know where she ends up. But Underland is not as we remember it, and Alice doesn't remember it at all. The Red Queen (Helena Bonham Carter) has usurped her sister The White Queen (Anne Hathaway) and, with the help of the Jabberwocky, has enslaved Underland. Many of its people believe that Alice is their saviour, even though she believes it to be a dream and refuses to accept that she is the one who will have to slay the Jabberwocky. 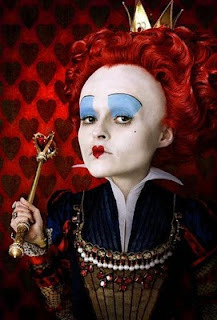 Acting more as a sequel to a film that was never made, but the story of which we all know, Burton's take on Alice makes some bold choices that set it apart from the adaptations that precede it. Aging Alice so that she is an adult, rather than a child, gives a completely different tone to proceedings. No longer a child frustrated by Underland, Alice approaches her situation with a much more measured and adult response; she refuses to believe any of it exists, and goes along in the belief that it is all a dream. And placing the story within a more conventional framework allows Burton to use the mad characters without trying to capturing the madcap tone of the books. This also removes the cruelty of Carroll's story since Alice, played with luminous grace and charm by Wasikowska, no longer seems like a child being taunted by her own author. Tim Burton has always been a director with a specific visual sensibility, and Alice In Wonderland makes full use of his talents. Through his eyes, Underland becomes a dark and beautiful world full of characters who are equal parts endearing and creepy, and landscapes that are both photorealistic and totally unreal. Though he doesn't stretch himself beyond his usual palette - the film is awash with black and white stripes - he uses them to craft a fantastical world that feels true to the Wonderland of Carroll and other adaptations, yet also distinct. Despite everything in its favour, Alice in Wonderland is far from perfect. In its attempt to fuse Carroll's sublime nonsense with a linear structure, the film combines scenes of Johnny Depp asking why a Raven is like a writing desk with moments of peril as Alice is chased across country by the Red Queen's minions. A love of the source material on a part of the creators is clear throughout, but there are times when the film adheres too closely to the books at the expense of its own story and flow. Now, Alice is such a ubiqitous character that I don't expect anyone will go in without at least some rudimentary knowledge of her story, but explicitly referencing the novels so often becomes a distraction. The final third of the film also suffers since, after an hour and twenty minutes of really interesting performances and an engaging plot, the film descends into typical blockbuster action. It's not a badly executed finale, just terribly out of place. Considering that the rest of the film, whilst not without moments of excitement, derives its thrills from short, sharp outbursts of action, the shift to having two armies duking it out whilst Alice climbs a nearby structure to duel with a CGI Jabberwocky is incongruous, to say the least, and ultimately disappointing. Before it flies off the rails, though, Alice In Wonderland is a superior piece of entertainment. A great cast, a solid script, and a director with an assured hand manage to create something new from overly-familiar material.